PHD Downtown is located at 355 West 16th St.
OR those who have spent years absorbing life lessons from “Entourage,” PH-D is Xanadu: a glittering room of celebrities, beautiful women and cresting credit-card bills. 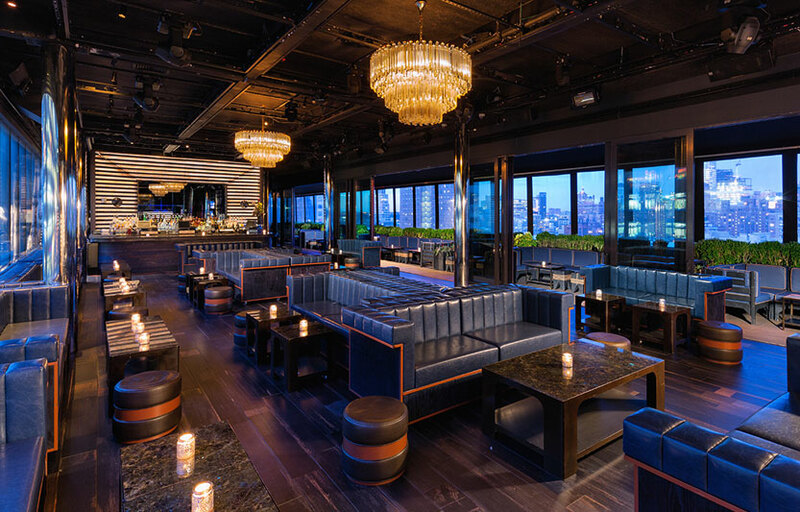 The nightclub, which opened in June on the roof of the Dream Downtown hotel, is the latest endeavor from the impresarios behind Marquee, Tao and other successful playgrounds for the well heeled. One recent evening, patrons looking for a soupy breather packed the terrace, a walkway flanked by black couches and groomed shrubbery. Bottles of Champagne and vodka cooled in tabletop ice basins. A man wearing a blue-check dress shirt and white trousers captivated pals with a joke from the trading floor. The kicker: “I’m on margin right now and can’t call you back!” Nearby tenement apartments seemed several universes removed. At the southern edge of Chelsea, PH-D sits atop Vikram Chatwal’s 316-room hotel, which also houses a poolside beach club and a steakhouse. While other lounges cultivate the timeworn comfort of a great-aunt’s living room, PH-D is a fine-cut diamond of glass and polished surfaces. Triple-tiered chandeliers with hundreds of glass rods hang above marble tables and leather seats. Midtown twinkles in the expansive view. GETTING IN PH-D is no shoebox (capacity: 400) but table reservations, IMDb profiles and tear sheets from Céline help to lubricate an elevator ride upstairs. Everyone else is left to the mercy of the doorman after 9:30 p.m. DRINKS The emphasis is on table service, but more-frugal customers can lurk at the bar. Thriftiness is relative: specialty cocktails are $18, and with tax and tip automatically added to the bill, a Jameson on the rocks surpasses $21. The place has a stunning view with lines of sight including the Hudson River and Empire State Building. There is a cover charge at the door. There are 2 separate bars. Where is PHD Downtown located? PHD Downtown is located across the street of the Google building in New York. How much is cover charge at PHD Downtown? PHD Downtown has a cover at the door which varies throughout the week. How long will I have to wait at PHD Downtown? Expect to wait anywhere from 20-40 min depending on when you arrive. When is PHD Downtown open? PHD Downtown is open everyday . What are the best nights to go to PHD Downtown? What is the dress code at PHD Downtown? How much do drinks cost at PHD Downtown? Expect to pay 15-20 for cocktails, 500-600 for bottles. What kind of music do they play at PHD Downtown? 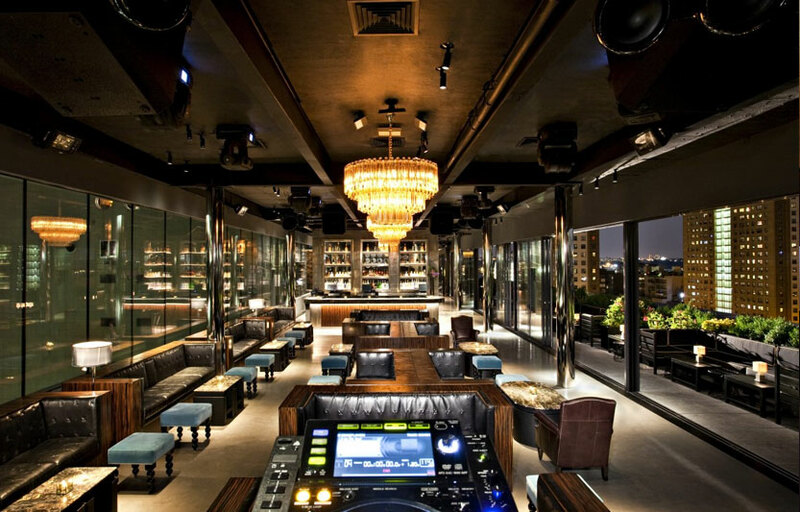 PHD Downtown features mostly top 40, with a mix of EDM and hip hop. Where can I find an list of upcoming events / DJs at PHD Downtown? You can download the Discotech app to see upcoming events, and book tables for PHD Downtown.